This is my first monthly favourites post but I'm not sure how well this will go as my favourite products don’t really change but I’ll try! ♥ Lush Yummy Yummy Yummy shower gel – This month I’ve slowly been adding in bath/shower products into my routines as my eczema is much better at the moment. I’ve been adding a little bit of this into baths to scent them rather than using it as a shower gel. I’ve not got much left so this is a good way to use it slowly. I think this is one of the products that Lush is discontinuing but I’m still not sure if I’m going to re-purchase this once it’s ran out as I’m trying to take sls/parabens out of the products I use. ♥ Liz Earle Eye Bright – For Christmas I got a small bottle of this in a kit and loved it instantly! It is by far the best eye make-up remover I’ve tried. It can also be used as an eye treatment to brighten up and soothe your eyes. I’ve been without it for about a month but finally bought a new bottle at the start of April. 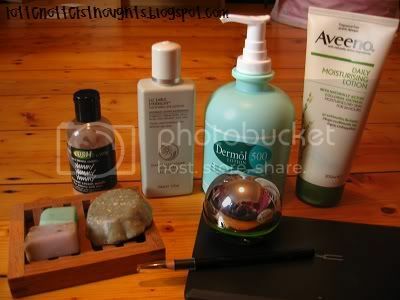 ♥ Dermol Lotion and Aveeno Daily Moisturising Lotion – The dermol lotion is my substitute for soap as prescribed by my doctor and dermatologist. The combination of the two have changed my skin so much! My elbows are no longer dry which is a miracle. ♥ Tray of soaps from Amy’s soap store – I love my little soap dish that I bought from Etsy which holds the soaps I ordered from Amy. All three are really great soaps which I’ve been using all month and I’m already planning my next order since she added new products! ♥ Barry M Fabulous Kohl Pencil in black – This was one of the prizes in Steph’s giveaway that I won and it is amazing! It is so pigmented and stays for hours on the waterline. ♥ Mac Palette and depotting – I finally bought a Mac palette this month and have loved it! I’ve been depotting all my shadows that will fit in it. I really like space saving ideas and as I have a Mac quad palette I can take a couple of shadow with me instead of the whole palette.